Of the 1.65 million lawsuits enforcing federal laws over the past decade, 3 percent were prosecuted by the federal government, while 97 percent were litigated by private parties. When and why did private plaintiff-driven litigation become a dominant model for enforcing federal regulation? 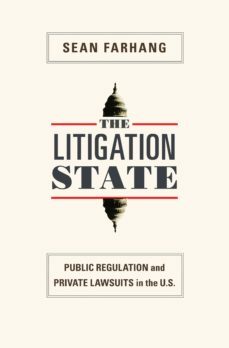 The Litigation State shows how government legislation created the nations reliance upon private litigation, and investigates why Congress would choose to mobilize, through statutory design, private lawsuits to implement federal statutes. Sean Farhang argues that Congress deliberately cultivates such private lawsuits partly as a means of enforcing its will over the resistance of opposing presidents. Farhang reveals that private lawsuits, functioning as an enforcement resource, are a profoundly important component of American state capacity. He demonstrates how the distinctive institutional structure of the American state--particularly conflict between Congress and the president over control of the bureaucracy--encourages Congress to incentivize private lawsuits. Congress thereby achieves regulatory aims through a decentralized army of private lawyers, rather than by well-staffed bureaucracies under the presidents influence. The historical development of ideological polarization between Congress and the president since the late 1960s has been a powerful cause of the explosion of private lawsuits enforcing federal law over the same period. Using data from many policy areas spanning the twentieth century, and historical analysis focused on civil rights, The Litigation State investigates how American political institutions shape the strategic design of legislation to mobilize private lawsuits for policy implementation.